As a new show season approaches it’s time to think about keeping those lambs in maximum shape. Their health is your top priority, and to keep them healthy and eating, you need to focus on keeping their gut in shape. Two seasoned lamb exhibitors agree that keeping lambs eating and healthy starts with clean, fresh water. Payton Dahmer, a student at Kansas State University from Nevada, Mo., and Maggie Madden, a student at Texas A & M from Paso Robles, Calif., both change their lambs’ water 2-3 times a day to keep it fresh, clean and cold. He said having an overall clean and fresh environment plays a big role in keeping show lambs healthy. Not only is clean water and fresh feed vital, but a clean environment with fresh bedding is just as important. Next, he puts a high emphasis on his lambs’ nutritional needs, and includes several BioZyme® products all containing Amaferm® to keep his lambs eating and healthy. Amaferm is a natural prebiotic designed to maximize the nutritional value of feed. It is research-proven to increase water and feed intake. In addition, research shows that Amaferm decreases body temperature in heat-stressed animals. 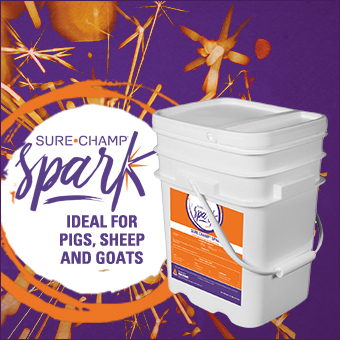 Dahmer says all the lambs that he and his siblings show are on Sure Champ® Spark®, a pelleted, concentrated daily supplement. He can tell within a day or two if they run out of the product because if the lambs don’t get in their daily ration, they will start to go off feed. 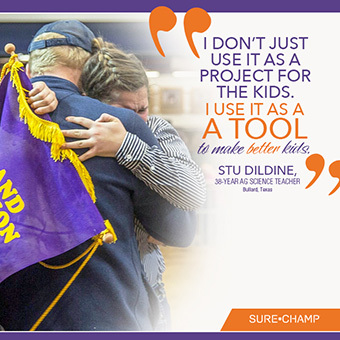 Another product he uses regularly is Vita Charge® Liquid Boost®, a liquid supplement that supports digestive health and promotes feed and water intake during times of stress and recovery. Just as each lamb has different nutritional needs their exercise needs also differ. Some lambs might need walked to simply build muscle, while others might need to be run to build muscle and burn fat. That additional exercise causes stress to the animal – stress that could cause it to back off from eating. Madden said she feeds a high-protein, highly palatable feed and includes Sure Champ Sheep in their diet to keep them eating. She monitors their health and diet extra closely any time she changes or intensifies their exercise routine or if there are extreme shifts in the weather. 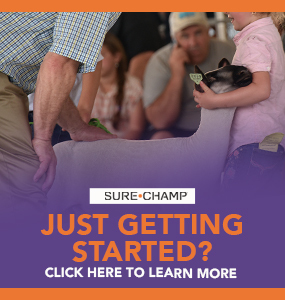 Dahmer said last summer when his family was exercising in the hottest days of summer, they started using the Sure Champ Climate Control, and noticed a big difference with their lambs. He suggests that others use that, especially in temperatures above 70-degrees as they increase their exercise program prior to shows. And if your lamb does go off feed? It is likely at some point your lamb will just decide to quit eating. At that point, Dahmer recommends cutting back their next feeding to a half-portion, and gradually building them back up to a full portion. He adds this is another time the Liquid Boost comes in handy. Finally, Dahmer said as you are getting prepared to hit the local or state jackpot circuit or a major livestock show in your area, to make sure you lambs are healthy before you even leave home. Madden adds to always seek advice of others. Success in the show ring starts with a healthy lamb, and your lamb’s health starts with a healthy gut.